Born: 22nd February 1885, ‘in a van at Saltmarket’ Glasgow, Lanarkshire, Scotland. 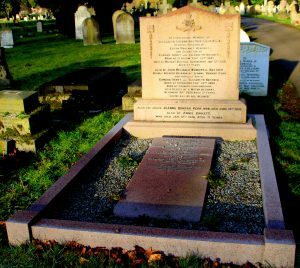 Died: 12th January 1919; age 33; Died – Pneumonia & Influenza – at the Dovercourt Military Hospital, Essex the day he was due for demobilisation from the Royal Garrison Artillery. Enlisted as Gunner – 15th May 1916. Commissioned: 7th September 1916 – Essex & Suffolk Regiment, Royal Garrison Artillery. 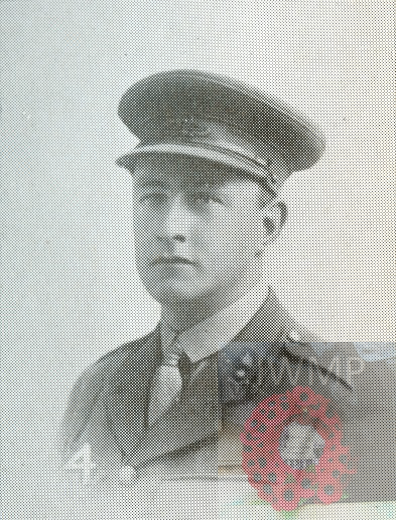 Promoted: Second Lieutenant – 1st February 1917. 1891 67, Palatine Road, Stoke Newington, North London. Alexander was 6 years old and living with his mother Elizabeth & siblings Arthur & Violet, at the home of his widowed, paternal grandmother. An aunt, cousins and father’s cousin were also staying at the home. Emma Bostock, 56, born Cressing, Essex. Fanny W. Bostock, 16, born Scotland. Juila Bostock, 28, born Trowbridge, Wiltshire. Elizabeth Bostock (nee Bostock), 31, born Leek, Staffordshire. Gordon Bostock, 6, born Islington, London. Arthur Douglas Fairgrieve, 4, born Scotland. Violet Hilda Bostock, 3 months, Colinton, Edinburgh, Scotland. Claud William Bostock, 3 months, born Stoke Newington, North London. Harriet Maud Prosford, 30, born Tolleshurst Knights, Essex. 1901 Institution Place, Dollar, Clackmannanshire, Scotland. Alexander was 16 years old, a Student and boarder at the academy. Alexander attended Dollar Institution from 9th January 1901 until 1904. He boarded with the Rector Dr Thom. Alexander won awards for French, Gymnastics & Drawing. His two brothers also attended the Dollar Academy. Alexander studied medicine at Glasgow University, but gave it up to join in the management of his father’s businesses. He was in charge of the Hippodrome at Ipswich. 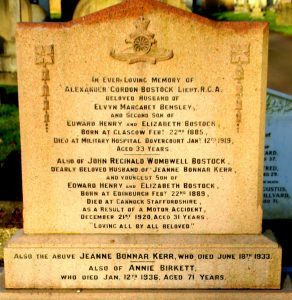 Alexander’s father was Henry Edward Bostock, born October 1858, Stony Stratford, Buckinghamshire – died September 1940, Glasgow, Lanarkshire, Scotland. Henry’s life was spent organizing and touring with his menageries in Britain, Europe and the East, with the assistance of his sons, and in promoting and managing circuses, theatres, and cinemas. His ventures in Glasgow, Ipswich, and London were of special importance. He wrote a book “Menageries, Circuses and Theatres“, published in 1927. He also owned Hippodromes in Paisley, Hamilton, Motherwell, Wishaw and Greenock in Strathclyde, and a cinema at Blantyre, Strathclyde. A member of Glasgow City Council 1908 – 1911, and in 1917 was elected a J.P. He was a rotarian, a philanthropist, and a devout churchman, as well as being a Fellow of the Zoological Society. Bostock Road, Ipswich commemorates his association with the town. In 1918, Alexander married, Elwyn Margaret Bensley, born 1899, Ipswich.